Arkansas weather is notoriously hard to predict. One day there’s sunshine; the next a tornado could be on the horizon. Sudden changes in weather are especially dangerous for drivers. 1 out of every 5 vehicle accidents is weather-related, according to the National Highway Traffic Safety Administration (NHTSA). A “weather-related crash” is one that occurs in rain, sleet, snow, fog, or on slick pavement. Nearly 6,000 people will die in weather-related crashes each year. Many weather-related accidents are beyond your control, but by taking certain precautions while driving in inclement weather, you are more likely to arrive home safely. Given the choice between driving in rain or snow, which would you choose? 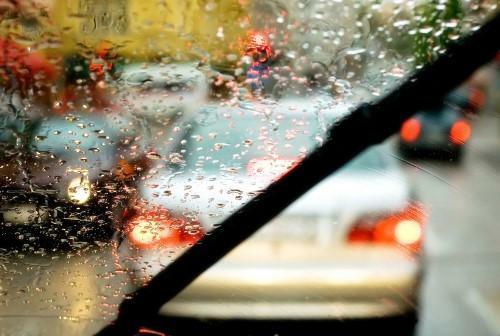 If you chose rain, as many of us would, you might be surprised to learn that you are much more likely to have a wreck in rain than in snowy conditions. Consider the NHTSA data: of all weather-related crashes, 17% occur when it’s snowing, 46% occur in rain, and a whopping 73% are caused by “wet pavement.” The main factor in weather-related crashes isn’t what’s falling from the sky, but what’s happening under your tires. Maintain your car. Check the tire treads (experts now recommend the “quarter test” rather than using a penny), replace worn tires, replace windshield wipers, and check your headlights, taillights, and brake lights to be sure they’re in good working condition. You don’t want to wait until it’s raining to get your car ready! Stay focused. You know it’s a bad idea to text, talk on the phone, eat food, or do anything else that distracts you while driving even in the best circumstances, so it’s even more important to focus solely on the road when rainy or stormy weather hits. Turn on your lights. In Arkansas, you’re required by law to turn on your headlights any time you use your windshield wipers; they’re a package deal. Slow down. Reduce your speed by about 1/3 when it’s wet or rainy. Wet conditions reduce the friction between your tires and the road. If the friction is reduced to nothing, it’s called hydroplaning. This is also very important for icy conditions. Keep your distance. While it’s never a good idea to drive closely behind the car in front of you, it’s especially important to give them some extra space when it rains. This is doubly true if you’re behind an eighteen-wheeler. If you do hydroplane, your first reaction may be to slam on your breaks. Instead, it’s important to react calmly and gradually. Gently take your foot off the gas pedal, and gently apply pressure to your brake pedal. Don’t turn your wheel sharply, either into or away from the skid. Instead, continue to steer in the direction you want to go – straight down the road. Were you injured in a weather-related crash where the other driver was at fault? You may have legal rights to compensation for your pain and property damage. The attorneys at Taylor King Law are ready to help. Call 1-800-CAR-WRECK (24 hours a day, 7 days a week) to begin your FREE consultation. Taylor King will listen to your story and offer his professional opinion. You’re one call away from getting help today.